It’s that time of year again. You’ve got your semester one results back, have had time to cry in your room for a few days, and then a little more time to realise the error of your ways and promise yourself that this semester will be different. This will be the semester when you get your act together. You’re going to keep up with your lecture notes from the first week, commit to going to every single lecture, lab and tutorial (compulsory or not), and finally use your highlighters for something more than drawing pictures of animals in your course guides. Funny, that sounds pretty similar to what you told yourself 6 months ago… and 6 months before that. But somehow every semester you end up pulling an all-nighter the night before your exam. Why are we like this? Why do we insist on putting our future selves through all that pain? 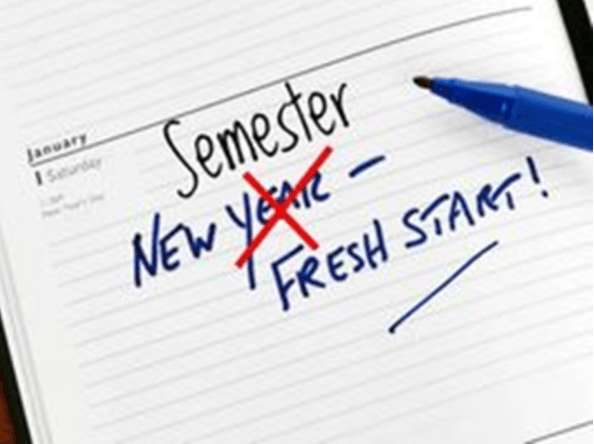 Like the infamous New Year’s resolution, new semester resolutions often end up in the trash by the end of week two… if they’re lucky enough to have made it that far. I mean, surely lecturers don’t expect you to show up to class when it’s raining outside, do they? Well, while this may come as a bit of a shock to some, you’re probably not going to melt in a little bit of rain, that episode of Game of Thrones will still be there AFTER you’ve finished your readings, and normal adults don’t actually NEED to take naps every day (although I would still recommend these from time to time). Don’t let this semester end up like every other semester (which if you’re like me can equate to several minor breakdowns). Learn from your mistakes, and take some time to set some goals now. Make them achievable, take them seriously, and you’ll be surprised where you end up in 12 weeks’ time. And then make sure you reward yourself with a nice long nap.